A real-money gambling app has been launched on Facebook - the social network's first. Developed by London-based online gambling operator Gamesys, the Bingo Friendzy app allows users aged 18 and over to play games for cash prizes. Facebook said only its UK members would be able to view the app. The website's largest gaming partner, Zynga, said it also planned to introduce real-money gambling versions of its games next year. 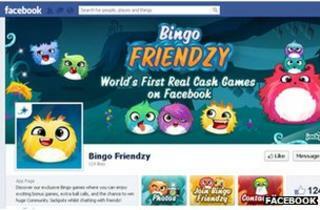 A Facebook spokeswoman stressed Bingo Friendzy was not a joint venture, saying the game had been developed entirely by Gamesys. "Real money gaming is a popular and well-regulated activity in the UK, and we are allowing a partner to offer their games to adult users on the Facebook platform in a safe and controlled manner," she told the BBC. Facebook intends to use age-gating technology to ensure under-18s and "vulnerable people" are unable to access the app. The social network typically takes a 30% cut of transactions on its network, but would not confirm if that was the case with this title, saying it was "commercially sensitive information". Gamesys, one of the largest UK online gambling companies, operates the Sun Bingo and Heart Bingo, as well as the UK's leading bingo-and-slots website Jackpotjoy.com. In its press release, the company said users would have access to self-help tools to reduce the risk of gambling addiction, including the ability to set spending limits. Facebook said the decision to launch a real-cash gambling app in the UK had been motivated by "a mature and very well-regulated gambling market". Gamesys' gambling activities are licensed and regulated by the government of Gibraltar, allowing it to offer titles in the UK. In the United States the situation with real-money online gambling is more complicated - the law currently forbids banks and others offering payment processing services to betting services targeted at US citizens.